ERC 1300 is bidirectional transmission equipment. It transmits one video signal, audio, data and contact closure on one optical fiber. The excellent quality of the video transmission (S/N = 67 dB) is performed by the expertise of processes including digital coding, digital filtering and 10 bits video technology. At the first service, with help of the AGC, no setting is required. As an option the output signal of the receiver is distributed on 2 SMB connectors with the same quality, to double video accesses. An audio gain adaptation permits balanced or unbalanced audio input/output without loss of level signal. Modules are adapted to the RS 232, RS 422 and RS 485 (4 or 2 wires) standards by internal setting. The back plane of the chassis is designed to collect and centralise data through one access board only. 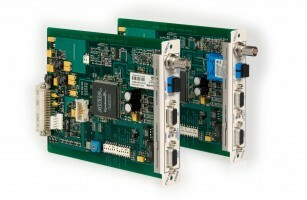 Transmitter and receiver are presented as pluggable board modules. ERC 1300 can be plugged either in a stand alone box ERC 17SA or in the 19’’ 3U chassis ERC 17-001. Those modules can be removed or insert of their housing under power without any perturbation. Equipments housing in chassis can be supervised by the ERC 17 GUARD (HTTP or SNMP) module. Only one ERC 17-001 chassis is able to receive up to 13 ERC 1300 modules. Copyright © 2019 Ereca - All rights reserved.